Nicola incarnates Dot, our heroine, in a very special 8-bit quest: The Pixel Ripped stone is a magical rock that contains the soul of Dot's world, Adventureland, which has been stolen by the Cyblin Master. Your pixelated foe is using its powers to open a portal from the game into the real world, bringing with him robots, dragons and general chaos! Be ready to "think 4th dimensionally" if you want to beat Pixel Ripped! Prepare to face a metagaming world full of surprises and tons of retro nostalgia! A game within a game, Pixel Ripped is original, fun and packed full of surprises that will keep you guessing along the way. From the floor of 1970’s living room where you will be playing the first home gaming console, all the way up to the turn of the millennium. You’ll be treated to 2D sprites of the 70s to the bright and colourful 3D graphics of the 90s, Pixel Ripped truly is a nostalgic and mad trip down memory lane. Geek out searching for hidden retro-easter eggs as you fight the mundane distractions of life so that you can get down to what’s most important – gaming! 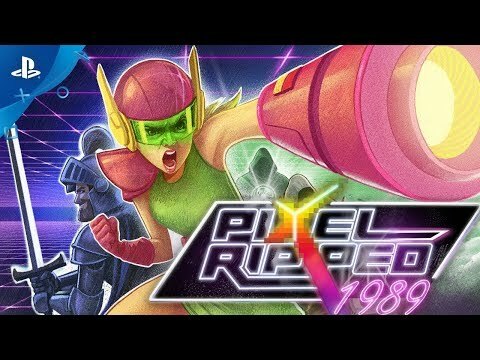 Pixel Ripped 1989 was released on PC and PS4 264d ago in the US and the UK. Notify me when Pixel Ripped 1989 is available. Based on 1 Pixel Ripped 1989 review, Pixel Ripped 1989 gets an average review score of 70.